Want to make a Christmas gift for someone you love? Or someone that loves photographs? I might have something that could help. Have a go at my Desk Calendar. 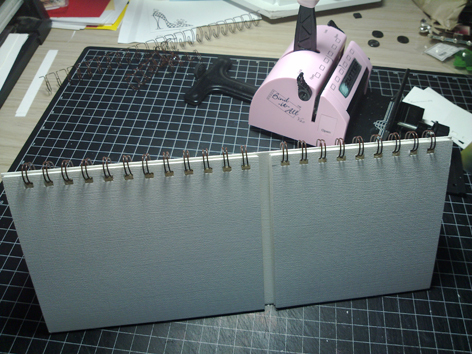 It’s free-standing, bound with the Zutter, but you could use rings also, or even punch holes and add ribbons. 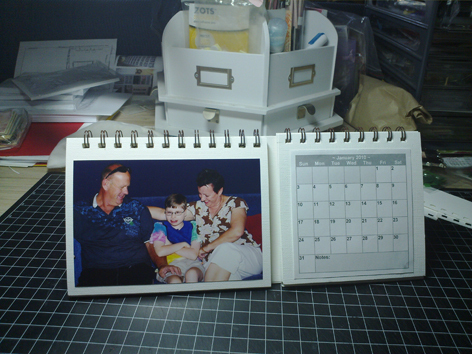 The two sections are kept seperate so Wendy can have whatever month with whatever photograph she’d most like to see. When the year is up, she can keep the photographs. This calendar would be perfect for Aunts, Nannas, or in my case.. perfect for Wendy. If you don’t know Wendy, she is Joshua’s Respite Carer. She keeps us sane, gives us a couple of nights sleep by caring for our big boy. I thought she might like some photos of him, she loves him like her own. Okay now I hope I get these instructions right for you, I’ve been kinda busy since I started this project. A calendar (which I have made in Word and can be downloaded here 2010-Monthly-Calendar) I printed mine on plain computer paper, but it would look really nice on Bazzil. I think I used 8 sheets of White Bazzil 12×12 all up. 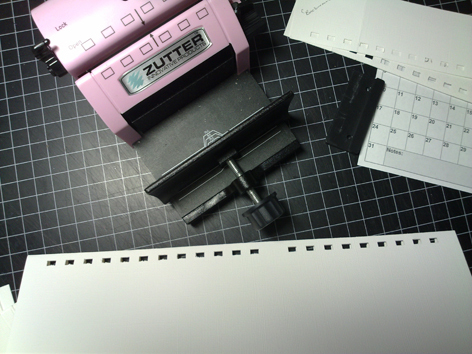 The first thing you need to do is cut your panels, so you have twelve of each size. 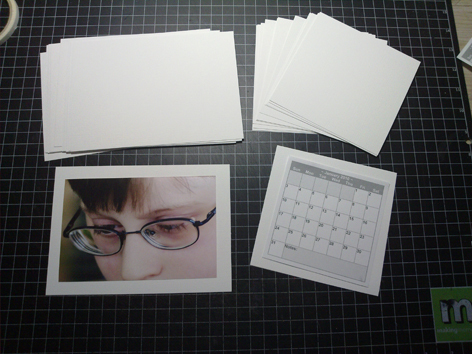 Then attach your photographs to the larger panels. How sweet is this shot of Josh? 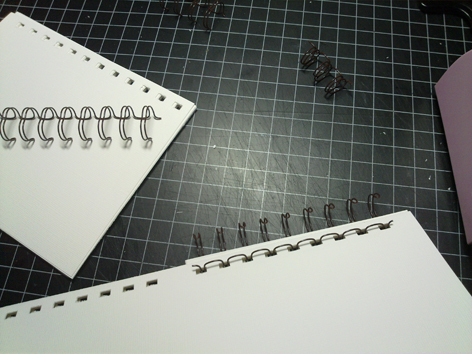 Stick them together as shown, overlapping on the 5″ sections. 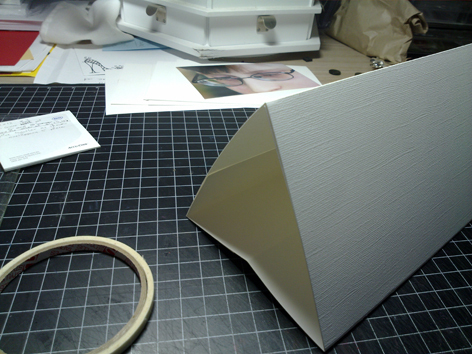 This is then folded up and adhered as shown to make the stand. The small fold at the bottom is so the whole calendar can be flat-packed to post or gift wrap. 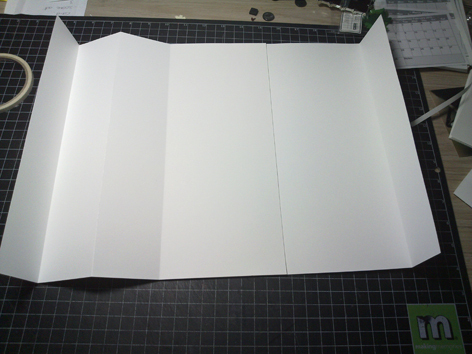 Fold it flat to bind it. I practised on a couple of sheets of scraps first to be sure I got the holes where I wanted them. If you have the machine here is what I did. I left a gap between them so they’d move freely. 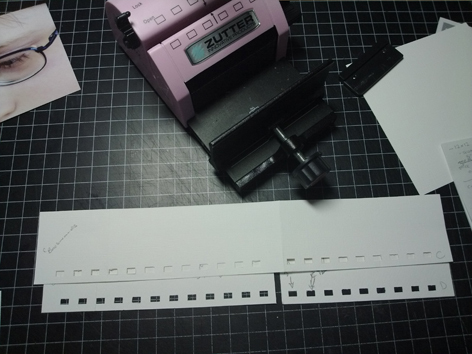 B – Move to the 5th hole – Punch. Add your binders. Cut them to two seperate sections. Embellish to your hearts content.